In early 1400’s France a wandering warrior with Chinese weapons faces werewolves among a massacred city. In present day Southampton a thief with no past and a secret talent for magic charms his way through heists and carefully deals with the dangerous family ties of his associates. If it sounds like I’m describing the premises of two different books I understand – that’s how I felt reading for a majority of Crimes Against Magic. The two parallel tales are connected of course, but the general atmosphere and tone was so different the switching back and forth was somewhat jarring. The past timeline also became much less compelling than the present during the middle of the book. Despite plenty of action and solid plot progression it still seemed to primarily exist for exposition. I’m mentioning this all up front because it’s directly connected to trying to give an idea of what the book is about and is worthwhile criticism to mention. I don’t want to give the wrong idea though – Crimes Against Magic rises above these small issues and is a pretty great read overall. A large part of that success is due to a variety of engaging and intriguing characters, particularly our narrator Nathan Garrett. He has as much to learn about himself and the strangeness of his world as he already knows, but he’s experienced enough to make things interesting even when in over his head. McHugh gives even minor characters little touches of depth that add significantly to the narrative and connection with the reader. Like with the characters and some general plot elements, the world building take familiar elements from various genres and combines and uses them to great effect in unique ways. Concepts and folklore are pulled from some many sources there are almost too many mythologies and creatures blended in, but as it all connects logically and is tightly connected to the plot and characters it ends up working well. One last thing I’d like to praise is the storytelling. Mysteries are unraveled gradually and with careful precision. My favorite type of book is one that foreshadows enough that I piece together some of the major developments from provided hints but still manages to surprise me. I got both here in abundance, including a couple of wonderfully shocking turns and a strong ending that have me very excited about continuing with the series. 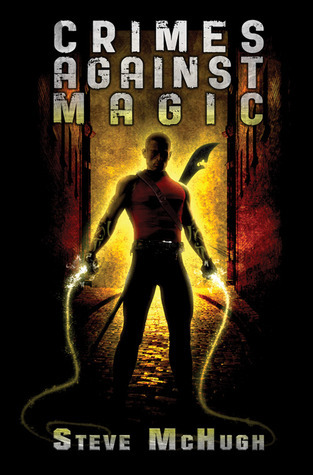 So while it does feel at times that the author tried to fit a little too much in one book, I really enjoyed Crimes Against Magic and it’s an easy recommendation for any fan of urban fantasy.